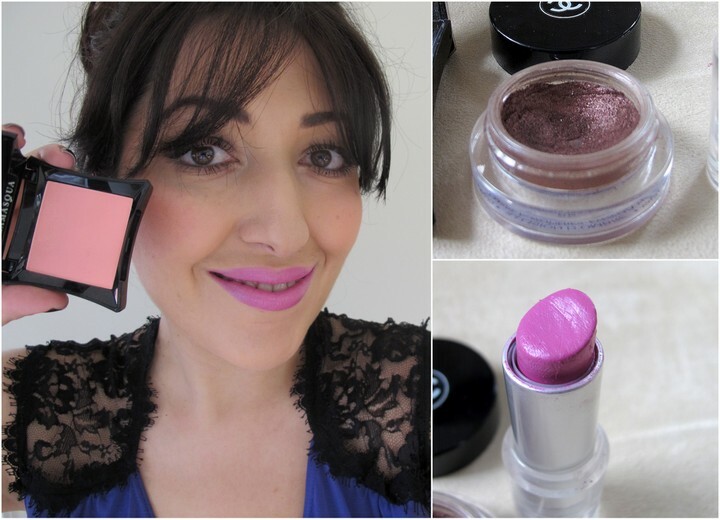 Illamasqua blush in Tremble - After Naked Rose, Tremble is my next favourite Illamasqua blush. Full review here. Chanel Illusion D'Ombre Eyeshadow in Ebloui - I bought this cheap at a blog sale and is one of my go to eyeshadows. It's one of those perfect shades that looks perfect worn on its own all over the lid. In this look I'm wearing it on its own blended on the lid up to the crease. Classics Lipstick in #227 - I bought this a couple of years ago from Armenia. I think it cost around $2. I absolutely LOVE this colour, but unfortunately I haven't been able to track down the brand since, or manage to find a good dupe for it. Australis VoluptaLash Comb Mascara in Black (I like to layer two different mascaras, one for volume and one for length). What are some of your favourite products that help you glam up in a hurry? I love those purple tones lipsticks! !It suits so well on us brunettes! !Gorgeous as always! Love that lipstick! Have you tried Lime Crime Airborne Unicorn? Hi Sarah, I have Airborne Unicorn but it's too light and blue based in comparison to the Classics lippy. I'll have to keep searching! Gorgeous lip color! Looks gorgeous on you! I love Up the Amp as well, it's a great autumn shade. But unfortunately it's much darker than this one I'm wearing... I've been looking everywhere but can't find a good dupe for it. Oh well... will keep searching, as this one is about to run out! You look gorgeous as always hun and I'm glad that you and hubby got to spend some nice time together! I use the following products to 'glam up' when I'm in a hurry: MAC Dame blush, MAC eye kohl in Teddy, Estee Lauder eyeshadow in Lilac and Napoleon Perdis lipstick in Aphrodite- not all at once though!